Those who see governments banning ownership of bitcoin are ignoring the political power and influence of those who are snapping up most of the bitcoin. To really understand an asset, we have to examine not just the asset itself but who owns it, and who can afford to own it. These attributes will illuminate the political and financial power wielded by the owners of the asset class. And once we know what sort of political/financial power is in the hands of those owning the asset class, we can predict the limits of political restrictions that can be imposed on that ownership. The rate of home ownership has declined to 63%, which is still roughly two-thirds of all households. Clearly, homeowners constitute a powerful political force. Any politico seeking to impose restrictions or additional taxes on homeowners has to be careful not to rouse this super-majority into political action. But raw numbers of owners of an asset class are only one measure of political power. Since ours is a pay-to-play form of representational democracy in which wealth buys political influence via campaign contributions, philanthro-capitalism, revolving doors between political office and lucrative corporate positions, etc., wealth casts the votes that count. I am always amused when essayists claim “the government” will do whatever benefits the government most. While this is broadly true, this ignores the reality that wealthy individuals and corporations own the processes of governance. More accurately, we can say that government will do whatever benefits those who control the levers of power most, which is quite different than claiming that the government acts solely to further its own interests. More specifically, it furthers what those at the top of the wealth-power pyramid have set as the government’s interests. Which brings us to the interesting question, will governments ban bitcoin as a threat to their power? A great many observers claim that yes, governments will ban bitcoin because it represents a threat to their control of the fiat currencies they issue. But since government will do whatever most benefits those who control the levers of power, the question becomes, does bitcoin benefit those holding the levers of power? If the answer is yes, then we can predict government will not ban bitcoin (and other cryptocurrencies) because those with the final say will nix any proposal to ban bitcoin. We can also predict that any restrictions that are imposed will likely be aimed at collecting capital gains taxes on gains made in cryptocurrencies rather than banning ownership. Since the wealthy already pay the lion’s share of federal income taxes (payroll taxes are of course paid by employees and employers), their over-riding interests are wealth preservation and capital appreciation, with lowering their tax burdens playing third fiddle in the grand scheme of maintaining their wealth and power. Indeed, paying taxes inoculates them to some degree from social disorder and political revolt. Xapo was founded by Argentinian entrepreneur and current CEO Wences Casares, whom Quartz describes as “patient zero” of bitcoin among Silicon Valley’s elite. Cesares reportedly gave Bill Gates and Reed Hoffman their first bitcoins. Their first bitcoins. That suggests the billionaires have added to their initial gifts of BTC. The appeal to the wealthy is obvious: any investment denominated in fiat currencies can be devalued overnight by devaluations of the currency via diktat or currency crisis. Bitcoin has the advantage of being decentralized and independent of centrally-issued currencies. I submit that not only are the wealthy the likeliest buyers of bitcoin for this reason, they are the only group that can afford to buy a bunch of bitcoin as a hedge or speculative investment. Lance Roberts of Real Investment Advice recently produced some charts based on the Federal Reserve’s 2016 Survey of Consumer Finances (SCF) report– Fed Admits The Failure Of Prosperity For The Bottom 90%. Put another way: how many families can afford to buy a bunch of bitcoin? 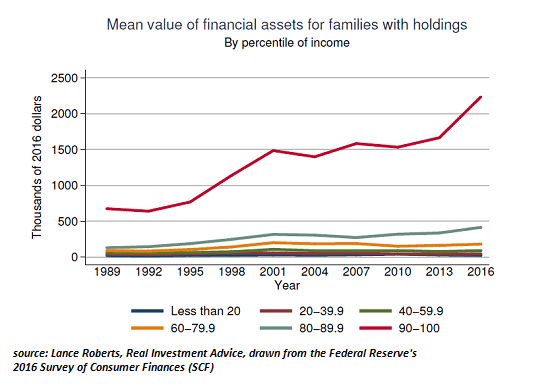 Here is mean family financial assets broken out by income category: note that virtually all the gains have accrued to the top 10%, whose net worth soared from $1.5 million in 2009 to over $2.2 million in 2016, a gain of $700,000. The Fed’s 2016 Survey of Consumer Finances is a treasure trove of insights into wealth and income inequality in the U.S. 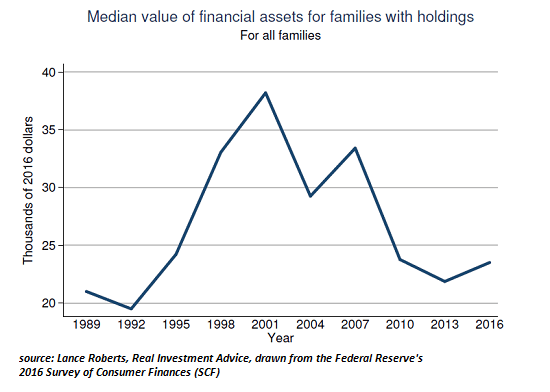 Here are the highlights: Changes in U.S. Family Finances from 2013 to 2016. As you’d expect, the report starts off on a rosy note: GDP rose by 2.2% a year, unemployment declined to 5%, and the median family income rose 10% between 2013 and 2016. Blah blah blah. Meanwhile, on page 10, it’s revealed that the top 1% receives 24% of all income, and the families between 90% and 99% receive 26.5%, for a total of 50.5% of all income flowing to the top 10%. The top 1% owns 38.6% of all wealth, and the families between 90% and 99% own 38.5%, so the top 10% owns 77% of total wealth. On page 13, we find that the total median net worth of all families between 40% and 60% went from $57,000 to $88,000, a gain of $21,000, while the median net worth of families in the 60% to 80% bracket rose from $166,000 to $170,000, a grand total of $4,000. Meanwhile, back in La-La Land, the median net worth of the top 10% soared by $468,000, from $1.16 million to $1.62 million. Which family has the wherewithal to buy a bunch of bitcoin at $5,900 each as a hedge or investment, the one that gained $4,000 in net worth, the one that gained $21,000 in net worth or the one that gained $468,000? You see the point: the likely buyers of enough bitcoin to count are the politically powerful financial elite. If any politico was foolish enough to propose banning bitcoin, a few friendly phone calls from major financial backers would be made to impress upon the politico the importance of blockchain technology and cryptocurrencies to the U.S. economy. Heck, the financial backer might just suggest that all future campaign contributions to the politico will be made in bitcoin to drive the point home. My vision of cryptocurrency, laid out in my book A Radically Beneficial World: Automation, Technology & Creating Jobs for All, is of a truly decentralized currency that directly funds work that addresses scarcities in localized community economies. The reality of existing cryptocurrencies is that they are probably being snapped up for buy-and-hold storage by the wealthy. Those who see governments banning ownership of bitcoin are ignoring the political power and influence of those who are buying enough bitcoin to matter. This entry was posted in Billionaire, Crypto and tagged Bitcoin, Bitcoin Ban, cryptocurrency on October 23, 2017 by Bone Fish. Interesting POV. We’ve seen some evidence of this with Putin et al shutting down exchanges and banning ICO’s until they can realign their financial structure to accommodate crypto until they can use it for their benefit.